Welcome to the eve of the weekend! More commonly known as Friday. 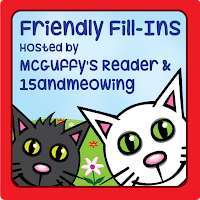 Given that it's that special day of the week, we'll get right to the always fun Friendly Fill-Ins challenge, hosted by our good friends at 15andmeowing and McGuffy's Reader. 2. My favorite magazine is _________. 4. Even though _________, I _________. 1. I am a Luddite. 2. My favorite magazine(s) is (are) Cat Fancy and Dog Fancy. 3. Recently, I learned that Thimble loves marshmallows. 4. Even though I don't paint, I really enjoy watching Bob Ross's show. Well, with the Fill-Ins all filled in, that means it's time to give you all your main Eddy fix for the week. Believe it or not, I actually got the girl to sit still. But, it was in a relatively dark room, and she refused to look at me. Well, we gave it our best. Thanks for sort of cooperating, Eddy! We're wishing everybuddy a fantastic Friday! Although not exactly toxic to your cat or dog, it is not recommended that you feed your furbabies treats such as marshmallows. Foods like marshmallows contain a fair amount of processed sugar, which is not an ideal component in your furbaby's diet. 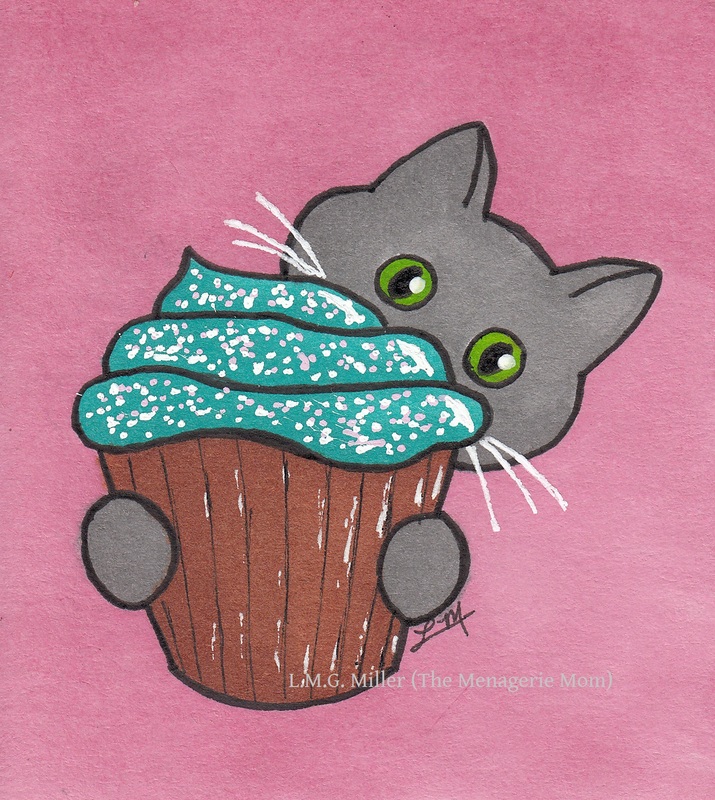 Especially if eaten in large quantities or at a high frequency, this sugar could potentially affect a cat or dog's blood sugar levels, and in a negative way, not to mention that there is always the potential for weight gain with unhealthy treats like marshmallows. What's more, especially for smaller animals, marshmallows and other large or sticky foods can be a potential choking hazard. So, when it comes to your furbaby, try to stick to those treats that are known to be safe and healthy. Thimble is not only a ridiculously adorable and talented model, but also a proficient watch kitty. She's always on the lookout. She watches out for any naughtiness from the resident pup. 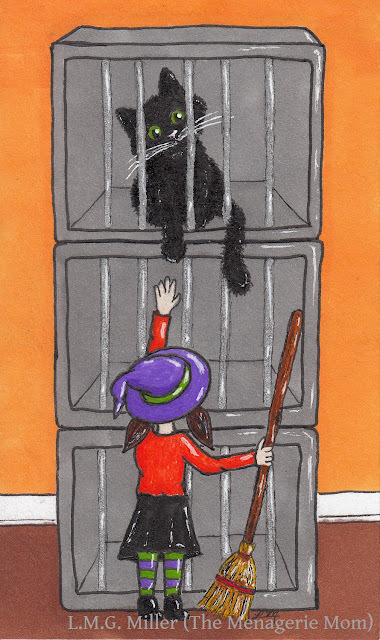 And she keeps those boy kitties in line, not to mention that ever active Eddy. Nothing gets past Thimble's attention. Well, unless she's on break. In that case, you might want to back off and let a lady chillax in peace. Happy Thursday to all of our furiends! So, we've all heard that cats sleep roughly 16 hours each day. Older kitties typically sleep even more than that, often 20 or so hours per day. Did you know, though, that this habit of excessive sleeping is more or less in a kitty's genes, thanks to their wild ancestors? Cats in the wild hunt for their food in order to survive, which can mean lots of stalking and tracking and running and jumping. All of that uses up energy, which means that when they're not hunting and eating, they need to rest up and conserve energy. So, our little domestic cats may not have to hunt for their food like their ancestors, but that doesn't mean that instinct and need to sleep isn't there. So, today's tip is a simple one, and that is to let a sleeping kitty lie. When you see your kitty resting or sleeping, although it might be tempting, try to refrain from too often interrupting them for cuddles and play and so forth. After all, a kitty needs her beauty rest! Unless, of course, you are concerned that your kitty is sleeping more than usual, in which case please consult a veterinarian. Despite posting a more varied selection of shots of pup Astrid lately, that doesn't mean she's given up her favorite pose of all. Remember the pouty window puppy? Mmmm. Who needs nuts when you have a perfectly good mushroom to chow down on? Autumn and Spring are two mushroom-heavy seasons. That being said, please keep in mind that some mushrooms are dangerous for our furbabies to consume. The truth is that only a small portion of mushrooms are toxic to cats and dogs, but that small percentage of toxic mushrooms can have life-threatening consequences if ingested. What's more, it's often difficult to distinguish between the dangerous mushrooms and the harmless ones. So, if possible, simply avoid locations with a high population of mushrooms. If you do find yourself in a mushroom-heavy area, though, please closely monitor your furbaby. Since it is so difficult to distinguish between types of mushroom, it is likely best to simply keep your pup or kitty from consuming any. Evan heard it was Toesies Tuesday. So, he decided that today he should give a review of his toesies. The verdict? He says they're quite delicious. Anybuddy else have delectable toesies? It is often perfectly normal for kitties to chew on their claws, as that is how they remove the outer husks, or sheaths, of the nails. That's why you sometimes find kitty claw husks lying around your house. That being said, it is nevertheless still important to always monitor grooming and other related behaviors. This is because even cats can have anxiety and obsessive compulsive disorders that result in behaviors such as excessive nail chewing, just like humans can. Kitties will also often over-groom in other regards when anxious, such as by excessively chewing or licking the paws, abdomen, or other areas of the body. These behaviors can also be the result of certain medical issues, such as in the case of dermatitis or even a UTI. As always, you know your kitty best. If you think your kitty is nail-chewing or overall grooming beyond what is normal or healthy, please consult a veterinarian. It's autumn. Or so the calendar says. We even, despite trying to hold out a little longer, already put up our Halloween header. 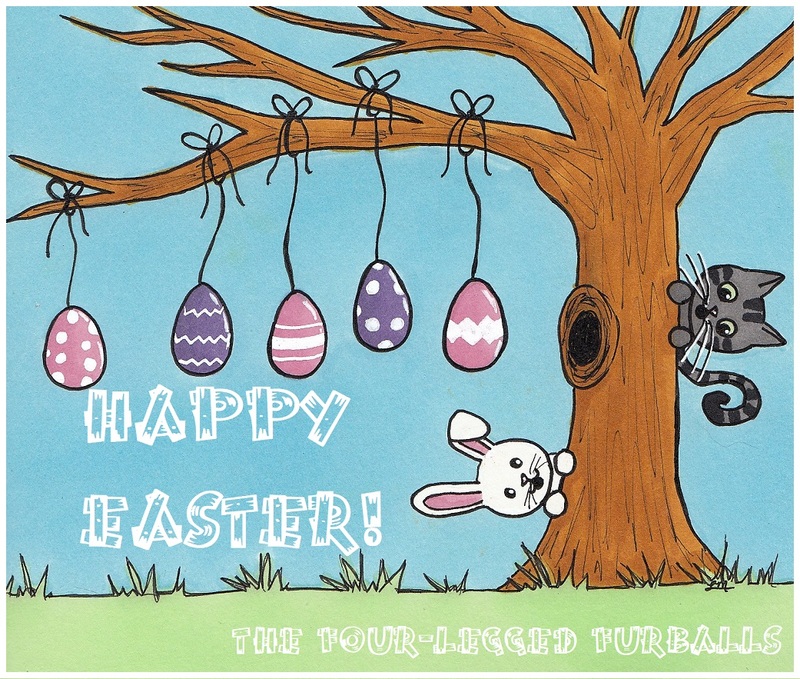 (I'm sorry, I just get such a kick out of this fun holiday.) But, the calendar only holds so much weight. Around here, Mother Nature is completely ignoring the calendar. Autumn started on September 22nd? Whatever, says Mother Nature. Three-digit heat index it is! Though I may be lamenting this extension of summer, someone around here is not. And that someone is my mancat Evan. This boy loves him some warm summer sunlight. Preferably at his beloved front door. How else would a boy roll around and bask in the sun? Evan says that Mother Nature can keep up her shenanigans, that's fine by him. He's quite enjoying his fun in this late summer sun. What about all of our furiends out there? Is Mother Nature going rogue on you? Or are you enjoying autumn weather already? As cooler weather approaches, it's perhaps time to start thinking about things such as furnace usage. For the safety and health of both you and your furbabies, don't forget the importance of furnace maintenance. Having an inspection of your furnace performed before using it for the first time each year is never a bad idea, as a furnace pro will be able to detect any hazards or other concerns that could be potentially harmful to your furbabies or yourself. What's more, don't forget to change the air filter regularly, and certainly consider dusting and cleaning around the air vents. This can, for example, ensure the littlest amount of dust and built up allergens from circulating throughout your house upon turning on the furnace, something especially important in homes with furbabies or even humans suffering from asthma or severe allergies. My furbabies all requested a vacation day today. I granted them that, because everybuddy needs a day off every once in a awhile. 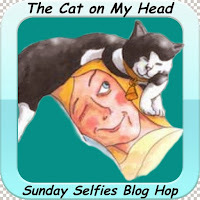 Well, that, and also because I had a couple of other models at my disposal for today's always fun Sunday Selfie blog hop, which is of course hosted by our Kitties Blue furiends over at The Cat on My Head. Now, who are these other models I speak of? Well, do you remember us mentioning in one of our recent Friday Fill-Ins posts that my parents took in two new kittens this summer? That's right, those two little kitties were the models for today's selfies! I only had to chase them around my parents' house for a couple of hours while they played and played and played, groveling and begging for them to sit still for even just half a second. Easy peasy! The first of these kitties to make its way to my parents' home this summer was a little calico who was found by one of my extended family members in a gas station parking lot at, believe it or not, roughly one day of age. That was back in May, and this little kitty is now roughly 4 months of age, and named Fizzgig. Strange name, huh? I actually like it, a lot. It's from an '80s fantasy movie called The Dark Crystal. This film contains a sort of vocal and loud little creature of a character named Fizzgig, and since this little kitty is indeed vocal and loud, the name seems to fit her quite well. Anyway, Fizzgig is one of the most playful and active kitties I have ever met (as in, she would even give my girl Eddy a run for her money). Being hand reared her entire life, she also loves humans and is extremely sweet, loves to snuggle, and gives some serious headbutts, not mention she'll drown you in the most adorable kisses imaginable. Oh, and she has this selfie thing down pat. Not long after Fizzgig joined the family, my uncle informed my dad that there was a kitten at his house that he was trying to find a home for. Apparently it was a friend of a friend's and was in need of a family, or something along those lines. Long story short, my uncle put a picture of the kitten on Facebook for my dad to see, and, well, my dad was sold. My uncle lives 2 hours away, yet my dad pretty much up and drove there that night to get her. She was soon after named Gilly, and she is another calico (we love us some calicoes, and now I need myself one), and her fur is gorgeously long. She is about 5 months old, and, especially when compared to her good buddy Fizzgig, Gilly is relatively relaxed. She actually tends to go limp when you pick her up, and if we didn't know better, we'd say she has some Ragdoll in her. Oh, and she's also ridiculously photogenic, and she knows it. So now you've met Fizzgig and Gilly! Luckily, my house is not far from my parents' house, so I help myself to visits with these cuties pretty much all the time. Don't forget the importance of taking new kittens to the vet to start them on a proper regimen of medical care. It is often recommended that kittens be seen by a veterinarian starting at roughly 6 weeks of age, unless, of course, a sickness or any other concerning factors require that they be seen earlier. Starting at that age, or sometimes a little older, kittens will usually be started on their first series of vaccines and deworming. They can also usually first be tested for FeLV and FIV around this time. Be sure to discuss with your vet whether the kitten will be an indoor, indoor/outdoor, or outdoor only cat, whether they will be an only kitty or in a multicat or multipet household, and any other important factors, as these details may affect what vaccines the veterinarian will recommend. And, once a kitten is started on a series of vaccines, be sure to schedule and bring them in for the following boosters in the correct time frame, as some vaccine boosters will be rendered essentially useless if too much time passes between them. And, of course, don't forget to do your part in controlling pet overpopulation by having those little furbabies spayed and neutered! I am hopeless. I was trying so hard to last until October before creating our Halloween header. Honestly, I only just created our general autumn header, we haven't even left September yet, and it's still 90 degrees F here, so why would I need to draw our Halloween header yet? Because I'm hopelessly in love with Halloween, that's why. 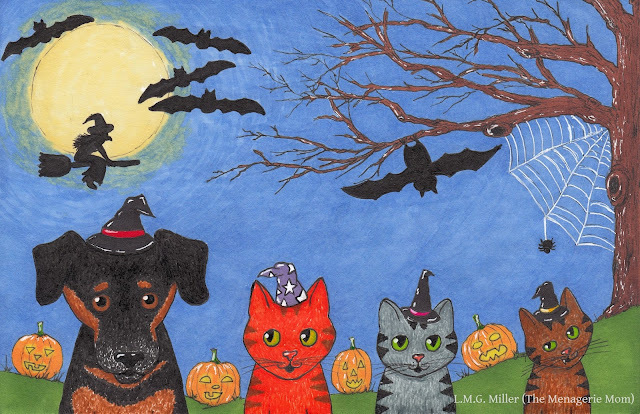 So, for today's Caturday Art blog hop, hosted by the always lovely Athena, we are debuting our Halloween header. We'll wait until tomorrow to actually implement it as our header, but we'll give you a preview now. I love me Halloween something fierce, so be warned, this will not be the last Halloween piece you'll see from us. Like I said, I'm hopeless. That's not all we have for you today, though. No, siree. Next up, Annie from McGuffy's Reader, one of the hosts of the Friday Friendly Fill-Ins challenge, recently nominated us for The Happiness Tag. Annie said such kind words about our blog, and we feel so honored and of course happy to receive this tag from her! Thank you, Annie! Now, there are a couple of fun responsibilities that come along with accepting The Happiness Tag. I need to list 5 things that make me happy, list 5 favorite songs that make me happy, and list 5 bloggers who make me happy and that I therefore want to nominate for The Happiness Tag. Me being me, this is probably going to get wordy. You may want to grab some coffee. Probably a comfy chair, too. Hey, you might as well bring a pillow, because you'll probably need a nap at some point. Now that you've been warned, we'll proceed. And, last but not least, I am to list 5 bloggers that make me happy and to nominate as recipients of The Happiness Tag. The thing is, you all make me happy! 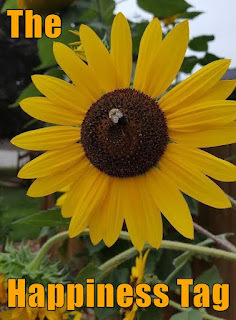 But, in order to properly complete this.portion of my Happiness Tag challenge, I've selected 5 blogs that indeed make me very happy but that I also believe I've not yet seen receive or perform the challenge associated with The Happiness Tag. You all make us happy! All those listed above, and all those not listed above (including Annie at McGuffy's Reader, who nominated us and so whom we could list), your blogs always make our day so much better and brighter. Thank you all! And thank you again, Annie, for your sweet nomination! Well, if you've made it this far, kudos to you. 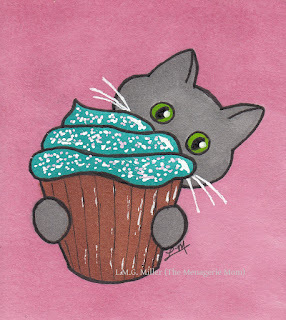 Here, take a cupcake as a reward for your perseverance. Well, whew, I think we've reached the end of this post. Congratulations! Did you know that bats are the most common carrier of rabies? Please always keep this in mind, especially if you live in an area of high bat population, and if your furbabies go outside at night often. And don't forget that bats can indeed get inside homes, too, such as into attics. If you find or expect bats inside your home, take all precautions to keep your furbabies away from them. Bats' teeth are small and sharp, often leaving little to no obvious puncture marks, so it can next to impossible to detect their bite on your cat or dog. That all being said, in the case of a bat inside your home or even one causing any concern in your area, it may be best to call animal control and have it caught by the pros so that any potential for rabies can immediately be determined and dealt with. 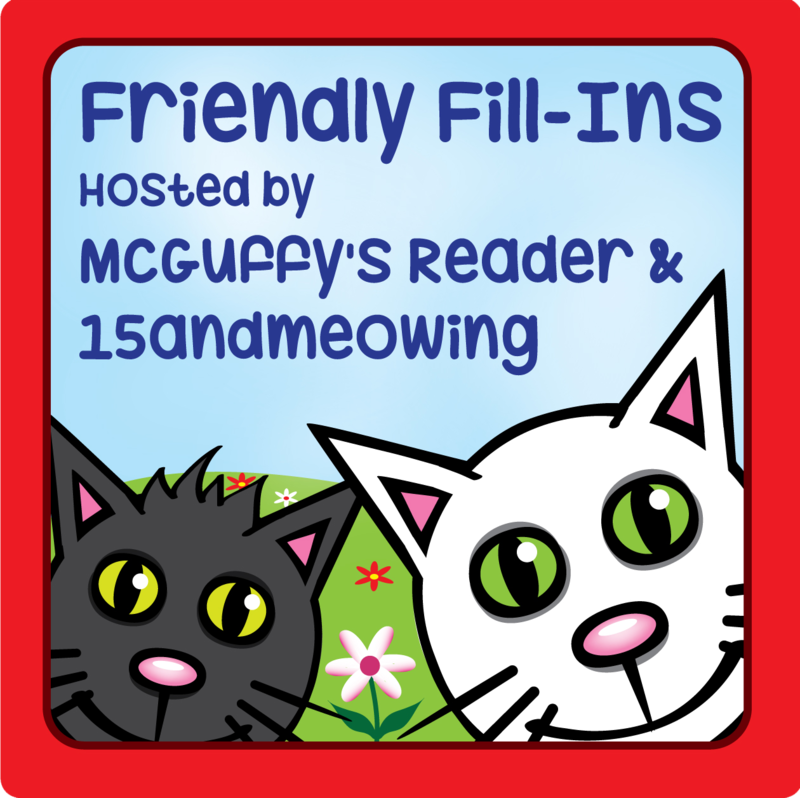 It's Friday, the weekend is upon us, and we've been looking forward to today's Friendly Fill-Ins challenge, hosted by the ever clever 15andmeowing and McGuffy's Reader. 1. The last movie I saw at the theater was _________. 2. The title of my autobiography would be _________. 3. I would love to learn _________. 4. I am glad that I learned _________, because _________. 1. The last movie I saw at the theater was Don't Breathe. 2. The title of my autobiography would be I'll Be in My Bubble. 3. I would love to learn how to play the violin. 4. I am glad that I learned how to cook and bake from my mom, because she knows all the tricks. Well, do we at least get an A for effort on that photo shoot? We want to wish all of our furiends a happy Friday! For the safety of your furbabies, remember to never leave any strings or cords dangling at your home. Strings for curtains and blinds can be a serious danger if your furbaby hooks them around their neck, or even around a leg. Some furbabies even try to chew on or consume such strings, which can result in a choking hazard or potential damage to the throat or intestines. And of course exposed electrical cords are hazardous for a number of reasons, such as if hooked around a furbaby's neck or leg, or of course if chewed on. Even consider how you leave things like handles to purses or other bags. Our furbabies can get themselves into trouble even during simple playtime, so always be sure to leave things like strings and cords tucked away or otherwise safe and secured. Instead of a usual Thimble Thursday post, Thimble would like to use this Thursday to honor the mission behind #RememberMeThursday. Remember Me Thursday­®, which falls on the fourth Thursday in September, was initiated to bring awareness to orphan pets. It is a movement that strives to unite shelters, rescues, and all pet adoption organizations and individuals worldwide, for the purpose of getting orphan animals to much deserved forever homes. That is why, today, we remember all those animals still in the shelter and rescue system who are awaiting their forever homes. We of course also remember those who, sadly, never made it out of the shelter system and never knew a forever home. Although we know that many of you already are, we would still like to ask all of you to please take a moment today to remember homeless shelter and rescue animals, and to spread awareness on their behalf. These sweet animals awaiting their forever homes cannot speak for themselves, but we can do it for them. Spread the message on Twitter and Instagram, using #RememberTheRescue and #RememberMeThursday. Even better, if you post a picture of your rescue furbaby on one of the two aforementioned social media sites today and use the two aforementioned hashtags, you will be entered to win $2,000 and other prizes for your shelter of choice! And, of course, please continue each and every day to spread the message and mission of finding forever homes for orphan pets. Please consider giving to this cause in any way you can, no matter how big or small. Consider adopting a shelter animal, or fostering one, or sponsoring a shelter animal, or donating your time or a little money or goods to a shelter in need, or of course bringing awareness to the shelter and rescue animals in your community and others. Cats, dogs, and all domestic animals deserve a forever home where they can know and feel love and happily live out their days. Young, aging, healthy, and special needs, they all deserve a home to call their own. So, let's all come together today, and every day, to help them find those forever homes. 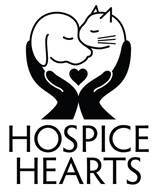 A fairly new foster-based rescue in our local area, Hospice Hearts focuses heavily on finding homes for animals whose previous owners have fallen sick, entered hospice care, or have passed away. It also focuses heavily on adopting out aging and special needs animals. My girl Eddy's Alma mater, CatSnap focuses on finding homes for many, many felines in our area. Most of these kitties are captured during TNR efforts (like Eddy) and adopted out thereafter. Like many of us in this wonderful blog community, we love to visit our friends over at Animal Shelter Volunteer Life. The amazing humans behind that blog volunteer their time at PAWS in Connecticut, a wonderful and clearly compassionate shelter that strives to find forever homes for the orphaned cats and dogs in that area. Happy autumn! And, of course, always #RememberTheRescue! If you are unable to or not yet certain about adopting an animal, please, if you are able, perhaps consider fostering. The more foster homes a shelter or rescue has at its disposal, the more animals they can take in and ultimately adopt out. Foster homes are crucial for animals in need of special care while awaiting their forever home, as well as for times when a shelter facility itself is reaching or at capacity. Sometimes, a foster home is only needed for a couple of days or less, while other times they are needed for longer. And often, especially in the case of a short-term or emergency foster situation, setting up even just a small (yet safe) area is not only beneficial, but potentially lifesaving. Shelters and rescues are grateful for both short-term and long-term foster homes, and for those that take in one and those that take in multiple animals, as all foster homes play such a significant role in getting more animals into forever homes. So, if possible, please consider fostering an animal. That being said, no matter what role you play in animal shelter and rescue efforts, whether it be adopting, fostering, donating, or spreading the word, please know that you can indeed make a difference. As I'm sure many of you know and have witnessed, as dogs and cats age, they often start displaying more gray and white hairs, just as humans do. You'll often see aging black dogs, for example, with white muzzles. Although of course every animal is different, keep in mind that some dogs and even cats may very well start developing more grays long before they start to show any significant signs of aging. Regardless of any of this, though, always remember that age itself is not a disease, so please try not to become disheartened at the thought of your furbaby aging. Though it is inevitable and of course distressing to think that our furbabies will indeed grow old and some day not be with us, it is important both for their sake and yours to focus on enjoying and making the most of the time you do have with them. Remember, our furbabies can sense far more than we can, and that includes our emotions. If you feel sad, they will know it, and it's certainly not fair for them to have to sense or witness their beloved humans sad, or to sense that they are the reason for your sadness. So, think of it in the sense that aging is simply a natural part of life. Even more so, please realize and know that your furbaby happily growing old with you is a wonderful thing, for both them and you. As seems to be a common factor for all furbabies in this family, pup Astrid can be a picky eater. She's nowhere near as picky as my little feline food snobs, but for a dog, or at least for the dogs that I've had in my life, she is a rare specimen of a picky eater. But, then again, I've never accused Astrid of being your run-of-the-mill pup. Astrid is especially picky when it comes to texture, such as when it comes to any dry food or treats. She's not a huge fan of having to crush food with her giant teeth. I always tell her that that's what they're there for, but she's not buying what I'm selling. So, she is simply not a fan of big, crunchy treats. Or even little crunchy treats, for that matter. What does Astrid prefer in terms of texture, then? Softer foods. When it comes to treats, therefore, she loves those labeled as being soft and chewy. That's not all, though. Astrid's also picky about flavor. Anything especially healthy, like carrots or corn or apple, those are just plain nasty if you ask her. And apparently, I recently learned, if a food is advertised as containing liver, that's a no-go. And although any turkey a human is eating is to die for, apparently turkey flavored dog food is just plain gross. So, what flavors does Astrid like? Beef. Chicken is pretty good, too, and ham and bacon, of course. But that beef, that stuff is legit. That's all why, when I saw Hill's™ Science Diet™ Flexi-Stix™ jerky treats offered as part of this month's Chewy.com Blogger Outreach Program, I immediately knew those would be the perfect thing for Astrid to review. These treats come made from either real beef or real turkey, and we, of course, went for the beef. As the label indicates, these treats are made with no artificial ingredients, neither artificial flavors nor preservatives. Beef is the #1 ingredient. What's more, they include glucosamine and chondroitin for healthy joints. Astrid was diagnosed with a bit of a faulty right hip joint way back when she was a puppy, so any added goodies for this are a plus for her. And, these treats are made in our very own USA. The treats come in little sticks, roughly a couple of inches in length. But, they are soft and can also easily be broken into smaller pieces if need be. Right from the get-go, a certain somebody knew what I was up to. Astrid only forgot her manners and tried to steal one of the jerky treats from the counter once. I guess, for the purpose of this review, that's a noteworthy transgression. ...Astrid finally performed a taste test. Suffice it to say, Astrid couldn't gobble these treats down fast enough. There was no chance of me grabbing anything resembling a decent action shot, but you can probably get the idea. In short, Astrid loves the Hill's™ Science Diet™ Flexi-Stix™ jerky treats in beef. They're soft and chewy, just how she likes them. And, in her humble opinion, they obviously taste delicious! Disclaimer: As members of the Chewy.com Blogger Outreach Program, we received the Hill's™ Science Diet™ Flexi-Stix™ jerky treats in beef in exchange for an honest review. All opinions are our own. We only review products that we believe will be of interest to our readers, and we never recommend a product that we do not believe in. Today's tip is a bit different than the usual, and relates to a discussion with and postulation made by Astrid's veterinarian at her annual this year. Although no studies have resulted in any solid conclusions, it is perhaps possible for dogs (or even cats or other furbabies) to display traits common to the autism scale as known in humans. For example, Astrid's veterinarian commented that many of her traits would in fact compel him to diagnose her with a canine form of Asperger syndrome. Astrid's obvious, consistent need for a calming Thundershirt in order to not pull or feel anxious on walks or anywhere in public (including the vet's office) first clued Astrid's vet in on this. There are other examples that we gave Astrid's veterinarian and that further compelled him to explain that he believes our furry friends can indeed display signs of autism and other unique social or compulsive traits often found in humans. 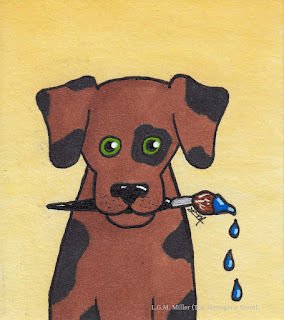 In Astrid's case again, for example, her aforementioned aversion to crunching food, and her dislike for and frequent retreating from sounds such as the clanking of dishes being cleaned or put away, would further prompt Astrid's vet to place her on a canine version of the autism spectrum. Just a couple more examples include Astrid's overall aversion to and anxiety being around large groups of people, or even other dogs, again especially when in large groups. That all being said, please always understand that even our furbabies can have compulsions and preferences, some more severely than others. Please always keep this in mind if your furbaby shows a dislike for particular textures of food, sounds, sights, or certain other stimuli. We are all different and unique in our own ways, and that of course includes our furbabies. 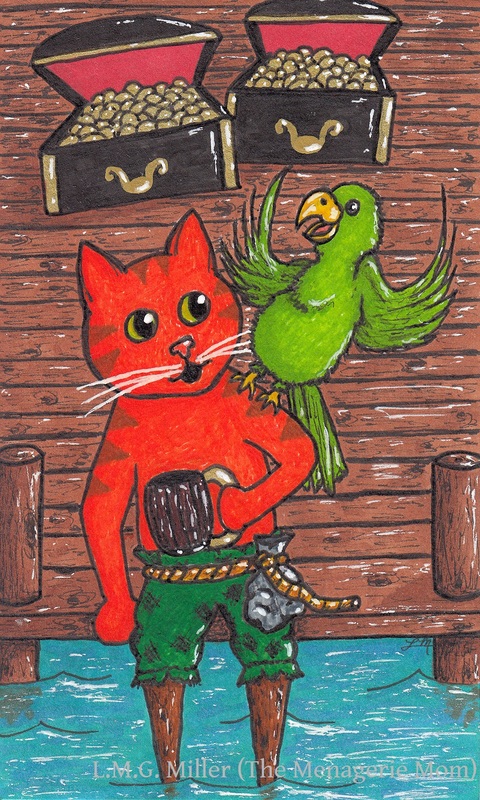 Mancat Monday: Aye Aye, Captain! What's funner than Talk Like a Pirate Day? Not much, that's what. 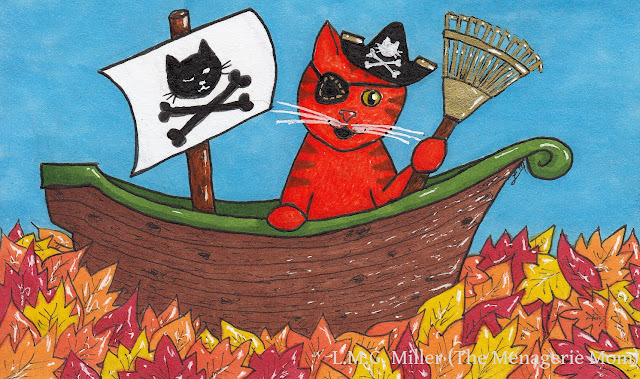 Around here, it is indeed more accurate to call it Meow Like a Pirate Day. This is in large part because the kitties are the most talkative of the creatures in our home. (Although the largest furbaby in the house, pup Astrid is, vocally speaking, essentially mute.) What's more, my mancat Evan is arguably the most likely to jibber jabber. So, how purrfect that Meow Like a Pirate Day falls on Mancat Monday! 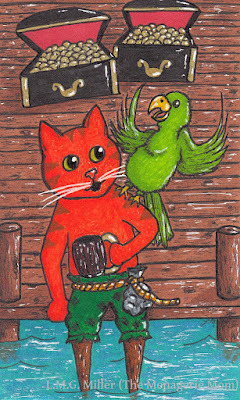 For the Caturday Art blog hop this weekend, we shared a drawing I made of of Evan as a pirate with his fair share of treasure, a celebratory drink, and a feathered friend. 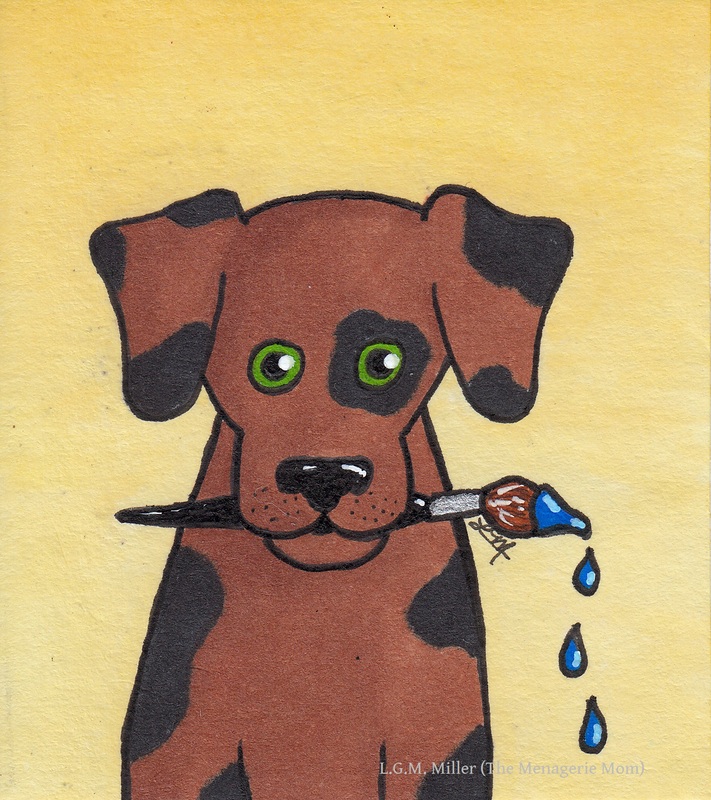 Evan, though, wanted another drawing, a brand new one to share on the big day itself. After all, it's not Meow Like a Pirate Day and Mancat Monday every day. A wonderful Monday to all of our furiends! Remember to take precautions to keep your furbaby safe and healthy this autumn. 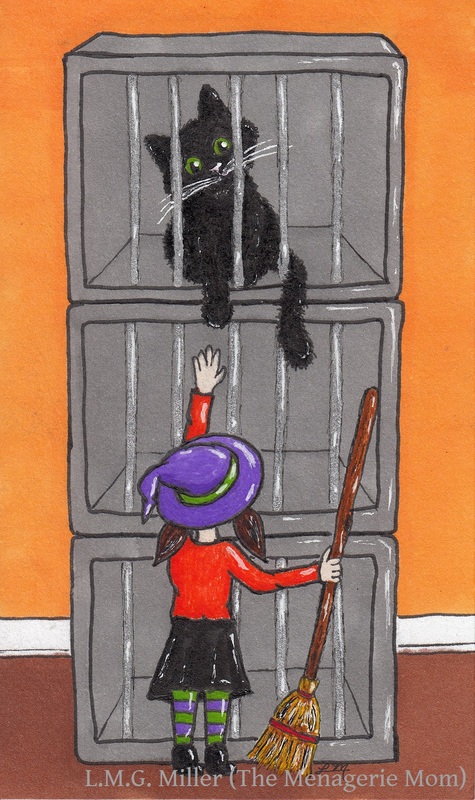 Cooler weather often means open windows, so please make sure that all screens are securely in place and escape artist proof. Also remember that autumn has its very own set of allergens, such as mold. Especially if your furbaby has known allergies and/or asthma, be cognizant of when and how long windows are open and therefore the home exposed to allergens. If you or even a neighbor are mowing or raking leaves, it may perhaps be best to shut all windows to prevent spurring any allergic reactions or asthma attacks. Autumn is a beautiful time of the year, but please still take precautions when and where needed. I'm sure we've all been told it at least once in our lives. When we were kids, little rascals overflowing with attitude, we were destined to hear our parents warn, "Don't give me that look." Can you believe, though, that I had to say those words while trying to help a certain furbaby prep for today's selfies? That's right. I asked my sweet little Thimble if she'd pretty-please-with-sugar-on-top give me a cute little pose for today's Sunday Selfie blog hop, hosted by our friends over at The Cat on My Head. You know what she did in return? She gave me "that look"! So, there you have it. Our contributions for today's blog hop is dripping with sass and cattitude, courtesy of Thimble. Studies have actually been performed and have proven that humans can read emotions on dogs' faces, and certainly the same goes for our kitties. After living alongside our domesticated furry friends for quite some time now, we have become attuned to the changes in their faces when they are happy, sad, fearful, angry, or feeling other emotions. That being said, especially when in new situations, keep an eye of your furbaby's face. Watch to ensure that he or she is not displaying an expression of fear or tension. Should you notice any such unwanted emotions on their face, try to figure out the source of the issue and address it. Our furbabies can wear their emotions on their sleeves just like we can, so use that to your (and their) advantage. Two legs are just as good as four. Caturday Art: Happy (almost) Autumn!